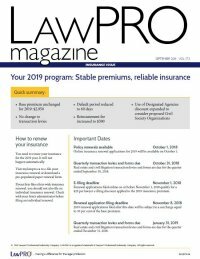 LAWPRO works to advance the role and reputation of lawyers in our communities and to enhance the viability and competitive position of the legal profession. Our public awareness campaign includes these articles designed to educate members of the public on common legal issues and help them understand when to seek help from a lawyer. I have the internet – who needs a lawyer? The volume and variety of information available on the internet has inspired many to adopt a do-it-yourself approach to solving everyday problems, from fixing a leaky faucet to treating poison ivy. Some people are no longer willing to believe that legal information is any more mysterious or challenging than any other kind of knowledge. Are you married and don’t know it? Canadians may be surprised to know that you don’t need a marriage ceremony or licence to be considered “married” in Canada. Most provinces have rules that give rights and create obligations for a person in a “marriage-like” relationship, generally known as a “common law” relationship. How to protect your brilliant idea: A brilliant idea can strike at any time, like a new invention, a catchy slogan, or the perfect love song. Protecting your brilliant idea, however, can be a complex process. How to make working from home work for you: If you’ve ever thought about starting a business out of your home, you’re likely well aware of the great perks it would provide: flexible work hours, being your own boss and of course, skipping the dreaded commute. But before you put the final touches on your new business cards, it’s important to understand the legal and financial realities of running a home-based business. Where you shouldn’t store your will: Creating a will and powers of attorney can add valuable peace of mind, not only to your own life, but to the lives of the people you love. But once you’ve had these important life documents prepared, where should you keep them? Did you know that a new marriage revokes your will? A few generations ago, most young people got married before accumulating many assets, and often didn’t have wills in place. Today, many people delay marriage and some are married more than once. This means it’s becoming more common for a person to get married with an existing will in place. Your life, your decisions It can be uncomfortable to talk about end-of-life planning. But without instructions, your loved ones may feel uncertain and even guilty about the decisions they may be asked to make on your behalf if you die or become incapacitated. Need to know facts about preparing your will: A will is your most important document. When you die without a will, the law decides what happens to your home and other assets, including your pets, as well as who gets custody of your children. Dying without a will means giving up your chance to make key choices than can impact those you leave behind. Learn the risks and rewards of being an executor: Fulfilling a loved one’s final wishes as the executor of their estate can be both rewarding and challenging. The role of executor has some weighty responsibilities and obligations attached, so it’s important to understand the risks and rewards if you are asked to be one. What to consider when shopping for a mortgage: Even when interest rates are steady, many homowners refinance their mortgages. In some cases, an existing mortgage is coming to an end and borrowers need to renegotiate. Other reasons for refinancing include funding renovations, paying for child’s education, or buying a second property. Buying a property with a rental unit? Read this first: As housing prices rise, homeowners may look to income from a rented suite to help carry a mortgage. This can be a great strategy if you follow the rules and are well-prepared for being a landlord. Here are five key things to know. What are renovation shows not telling you? Renovating a home can be a wiser investment than moving and popular makeover shows are certainly inspiring. However, these shows can also leave viewers with mistaken impressions. Why do I need a survey? Often, among the first things a lawyer will ask new homebuyer clients is whether there is a survey of the property available. Why do lawyers care so much about surveys? Do you know what buying your house will really cost? When you’re house-hunting it’s easy to focus on the “big” numbers like asking price and offer price. But before you sign the purchase agreement, you should take time to budget for the additional costs that come with every home purchase. Cottage ownership: Know what you’re buying There are few traditions more Canadian than weekends at the cottage. For many families, a cottage property provides the setting for both summer and winter holidays and allows multiple generations to spend time together. Does your lifestyle fit a condo? There are many appeals and attractions that draw Canadians towards the condo life. Simplicity, efficiency, security, even glamour are all features that attract people to condominiums. But before making a down payment on your castle in the sky, you may want to reflect on the life you’ve already built. Ask the right questions in a high-pressure buying situation: When your dream house is someone else’s dream house too, you may be facing a bidding war. Having to make an offer on short notice is not only stressful, it can present a real risk that something important will be overlooked. Five common threats that homeowners encounter: When you consider how much money and time you’ve invested in your home, it makes sense to protect your investment. It is important homeowners are aware of potential threats that can jeopardize the financial security of their greatest asset. Here are some of the most common risks homeowners will face. Important tips for home buyers: By the time most home buyers hire a real estate lawyer, they’ve already signed an Agreement of Purchase and Sale. But signing that agreement without legal advice can be risky in today’s housing market. Since you’ll need a lawyer to handle the closing, why not hire him or her before you’re legally bound to go through with the purchase? Is it better to buy a new or resale home? The decision to buy a home is usually both exciting and daunting. While you may know the size or style of home you want, such as condominium or townhouse, the choice between a new or resale home is another important consideration.